Monopoles provide an alternate solution for antenna mounting because of their limited space requirement and their aesthetically pleasing design. Monopoles are generally fabricated from hot dipped galvanized high strength structural steel in a continuous even taper with no bolted joints or sectional splices. 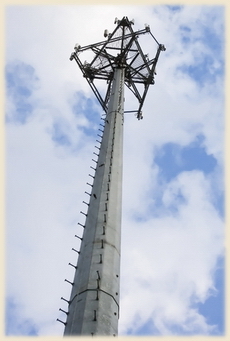 Monopole towers typically can be installed up to 250′ high using a concrete foundation.